To Cite: Ehsani Chimeh E, Akhavan Behbahani A. Factors Affecting the Service Delivery Locations of Newly Graduated Iranian General Practitioners, Iran Red Crescent Med J. 2017 ; 19(2):e40032. doi: 10.5812/ircmj.40032. Background: Many factors affect physicians’ dispersion across various locations in Iran. Identifying these factors can be effective in planning for a fair distribution of physicians throughout geographical areas. Objectives: This study aims to identify the key factors affecting newly graduated general practitioners’ (GPs’) choice of service delivery in Iran in regard to location. Methods: This was a mixed-method, applied study using a descriptive survey. A questionnaire was designed based on key variables extracted from relevant literature and analyzed from interviews with experts in the field. We used expert opinions to assess the questionnaire’s validity, and Cronbach’s coefficient alpha was calculated (0.925) to confirm its reliability. The questionnaire was randomly distributed among 400 participants (GPs) applying for their mandatory service in Iran during four periods in 2015 (100 participants were surveyed in each period). The data was analyzed using the 8th edition of SPSS and AMOS, and both exploratory and confirmatory factor analysis methods were applied. Results: Forty key factors were identified loading on five main factors during EFA, which explained 77.90% of the total variance. We used the following designations for the five factors: 1) socioeconomic developmental status, 2) geographical conditions, 3) personal reasons, 4) district health services, and 5) demographics. In CFA, the third factor has the highest weight with 0.97, and the first factor has the lowest weight with 0.89. But the slight differences among factor load show the importance of all factors. The highest weighted factor relates to a number of health center variables, such as the type of roads in the district, social development and liberation, physician efficiency in the region, and distance from the provincial capital. Conclusions: To resolve the unequal geographic distribution of physicians, it is necessary to consider the key factors affecting the attractiveness of a district for GPs and the existing demand for health services. Attempting to resolve the developmental inequalities among different districts, as well as implementing motivational policies to encourage physicians to work in less developed districts, is recommended. With the severe shortage of healthcare workers in Iran since 1981, the entrance capacity for the number of students in different medical fields and the number of educational institutions has increased both quantitatively and qualitatively. The growth rate was so impressive that the total number of physicians increased 20 times from 20,000 in 1981 to around 117,000 in 2008 (1). Despite this growth, the inequality and inconsistency of physician distribution throughout the country has caused this growth to be unequally experienced in different areas (2, 3). In 2008, the ratio of general practitioners (GPs) and specialists per 1,000 of the population was 1.02 and 0.44, respectively, in Iran. In contrast, the variation coefficients for GPs and specialists with the ratio of physicians per 1,000 of the population indicating the uniformity of physician distribution were 252.3% and 144.7%, respectively (4). Geographical mal-distribution of physicians is not specific to Iran. Rather, the imbalanced distribution of physicians and their focus in urban areas, together with their shortage in rural areas, has been considered a political problem worldwide for some time (5-11). According to the world health organization (WHO) in 2006, 57 countries around the world faced healthcare workforce crises involving the distribution of physicians, nurses, and midwives across different regions (8, 12). Also, in the United States, the physician to population ratio can vary up to two times for different states. Japan and Canada have the same workforce distribution issue as well. In England, despite having a regulated system, there is a meaningful difference among the different districts regarding physicians’ geographical distribution (13). Australia faces a significant difference of access to GPs in different geographic areas (14, 15). It should be noted that distribution criteria are not the only indicators of growth and development; rather, it is important to consider inconsistencies and causes of this issue (2, 3, 10). Some factors affecting the mal-distribution of physicians over geographical regions worldwide can increase the attractiveness of certain areas for GPs. Among these, economic and social factors are the most important (8, 16-18). According to Katz et al., relevant factors include physicians’ age, gender, and efficiency; the demand for health services; location; and payment system (19). The socioeconomic status of the location is another affecting factor (18, 20-22). Regarding the increasing number of physicians in training in recent years, it is necessary to identify these factors to avoid a potential shortage of physicians in neglected regions and a surplus of physicians in other areas. Either a shortage or a surplus of GPs would result in healthcare service delivery inequity in the country (1, 23-28), and both GP shortage and surplus have adverse effects on the outcomes, accessibility, equality, expenditures, and service quality of the national healthcare system (15, 29). In a study by Keley et al. in Iran, the number of specialists by specialty area is highly associated with 100,000 people in national public hospitals. Moreover, the regional dispersion of specialists has improved over the last five years (30). In another study, the most important factor causing physicians to change their location was identified as a remuneration system with four organizational, social, managerial, and psychological dimensions (31). Taghvaei and Shahivandi (2006) showed that the number of GPs is highly associated with the number of specialists, beds, hospitals, and healthcare or para-clinical centers across the country’s provinces (32). According to Isabel and Paula (2010), the geographical dispersion of physicians arises from an imbalanced distribution of income geography (33). In Japan, regional attractiveness for GPs has been determined by factors including the ratio of total employees recruited in an industry to the number of residents in a region, the price of commercial land in the area, and the number of the whole population per day in the region (34). As Ricketts and Randolph (2007) have indicated, socioeconomic factors determine the difference in the number of physicians between urban and rural areas (35). Scott et al. extracted the required financial incentives list for physicians necessary for improving primary healthcare service quality (36). Moreover, Mistretta indicated that quality of life factors do have a remarkable effect on the relocation and maintenance of specialists and their families (37). Studies in the UK have indicated the importance of physician income in the geographic dispersion of physicians (10). Identified factors in other studies include the following: the gender, university of medical study, ethnic origin, language, income level, and resources of the GP; the type (urban or rural), location, and/or geographic status of the region; the weekly average of patient visits, including the average time spent per visit; job characteristics and workload, including daily working hours; opportunities for education and promotion; the variety of skilled specialists in the region and specialty orientation; and, finally, organizational factors (8, 10, 14, 20, 38-42). According to Pedersen et al. not only do self-employed physicians have different preferences compared to recruited peers in organizations, but also factors such as workload, physician age, and working hours affect the tendency to work in different regions (43). Regarding the distribution of physicians, another study indicates that it is essential to consider the burden of disease, mortality rate, and chronic disease level, which requires long-term care, in addition to the important factor of region type (44). Dussault and Franceschini identified factors affecting health sector inequity in workforce distribution, which include individual, managerial, and organizational (i.e., organizational environment) factors; changes in the healthcare and medical education systems; socio-economic and demographic factors (e.g., migration); and financial incentives (29). Schofield et al. found that residents in deprived and underserved areas not only have lower health levels in comparison to privileged areas, but also have poor access to health services, especially GPs (14). In spite of all the legal requirements and attempts to appropriately and fairly distribute physicians across the country’s provincial regions, such as instituting a law for recruiting physicians and paramedics, centralizing the distribution of physicians and specialists on mandatory service, recruiting physicians based on organizational structure and demand for services, and giving office licenses to physicians (45-47), there are still provincial and, more importantly, regional inequities of physician dispersion that limit access to healthcare services (4, 37). This inequity results in an unequal level of health among people in different geographic areas. This study aims to identify key factors that affect newly graduated GPs’ choice of service location. These factors will be applied in an effort to redesign the current distribution pattern, which is not comprehensive, and they will be used to make essential policies that will alleviate healthcare inequalities and provide equal accessibility for all people in society. As yet, factors affecting GPs’ location choices have not been identified, and the variables of this study can be useful for modifying distribution patterns. In particular, these variables were assessed by newly graduated GPs and, therefore, shows their current needs. In such terms, this study is innovative, showing policy makers what policies and facilities should be considered for GP recruitment and retention in underserved areas. This was an applied, mixed-method study that used a descriptive survey. In each stage, quantitative and qualitative methods were used as needed. A literature review was used to extract research variables, and the variables affecting the choice of service delivery location from a GP’s point of view were extracted from different sources, including reviewing the literature from reputable national and international databases (e.g., SID, Elsevier, IranMedex, and PubMed); searching official websites of national and international organizations (e.g., Iran’s Ministry of health and medical council, the WHO, and reputable universities); in-depth interviews with stakeholders, physicians, managers, and experts from occupations relevant to human resources for health (HRH) distribution in different departments of Iran’s Health ministry. Each interview lasted almost 45 minutes. Afterwards, the variables were extracted through content analysis and data coding methods, and they were finally applied in the questionnaire. The interviews continued until data saturation was reached. In the second stage of the research, 42 variables were prepared as the primary research tools. Thereafter, they were validated and modified with the formation of 35 team members, including 10 newly graduated GPs; 10 university faculty members of relevant majors with backgrounds in execution, education or research for at least 10 years; and five managers and/or experts from each department related to HRH distribution in Iran’s Ministry of Health, each with at least seven years’ relevant work experience and an education level higher than a master’s degree. For the third stage of the research, in consideration of the mean scores and a Cronbach’s alpha of 0.925, a questionnaire was developed as a research tool with 40 variables within a range of 1 - 10. Next, the sample size was estimated to be 400, according to the Cochran formula Z = 1.96, p = 0.5, q = 0.5, d = 0.05. Accordingly, the questionnaires were distributed randomly in four periods (May, September, December, and March 2015) among 400 GPs (100 questionnaires in each period) who were passing their mandatory national human resource services in Iran. The participants were assured of the confidentiality of the questionnaire. In the final stage of the research, exploratory factor analysis was used to identify five key factors. Eventually, these exploratory factors were named, and confirmatory factor analysis was used to verify the model. In EFA, principal components and the orthogonal varimax rotation method were used with SPSS18. The scree slope criterion was used to extract the factors with a special value of more than 1 and factor loading of more than 0.3. Missing data was replaced with mean data. In CFA, AMOS modeling software was used; T-tests and one-way ANOVA were applied to examine the distribution difference of GPs based on age and gender. A demographic examination of the present study indicates that 392 questionnaires were filled out from a total of 400 questionnaires (a 98% response rate). Of the participants who completed questionnaires, 32% were female and 68% were male, 87% were married and 13% were single. Also, 76% of the participants were graduates from public universities. Exploratory factor analysis and orthogonal varimax rotation were used to identify the main factors of the GPs’ locations of interest. Finally, based on significant results (P < 0.001) and the Kaiser-Meyer-Elkin (KMO) test (KMO = 0.888), five factors affecting the GPs’ choice of location were identified. The findings of this research showed that these five exploratory factors could determine 77.90% of the total variance. The first factor has the highest weight compared to the others, determining 21.28% of the total variance. The second to fifth factors determined 19.50%, 16.70%, 10.40%, and 10.02% of the total variance, respectively. Confirming this model, the fitting set of variables shows that the model has a proper data fit: sig 0.000, RMSEA = 3.23, Khi2 = 0.072, CFI = 0.903, PCFI = 0.805, IFI = 0.901, and CFI = 0.903. Through an exploratory study, significant levels of the five variables obtained were less than 0.05, so these factors must affect the distribution of GPs. The third factor has the highest weight with a 0.97 coefficient, and the first factor has the lowest weight with a 0.89 coefficient. But the slight differences among the load of the factors show that each of the five factors has a considerable role in GPs’ selection of service delivery locations in Iran (Table 1). According to the findings of the CFA, the highest loading factor relates to the following variables: the number of healthcare centers, the type of roads in the district, the level of social development and liberation in the district, physicians’ efficiency in the region, and the distance from the provincial capital. Table 2 indicates the factor loading for the variables of each factor. Test results for the mean difference and significance level of male and female GP distribution is more than 0.05 (P value = 0.802). Therefore, the average GP distribution shows no difference between females and males. The GP distribution significance level based on age is more than 0.05 (P value = 0.851), which shows no variation between different age groups. 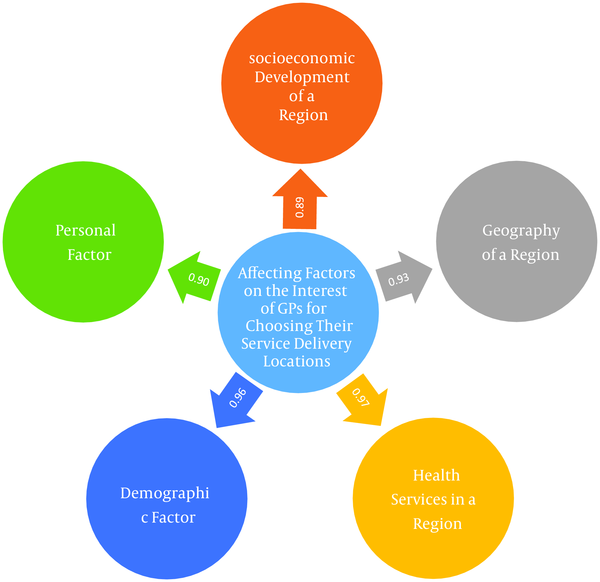 The findings of the current study show that exploratory factors that have an effect on the desirability of locations for GPs are generally categorized into five classes: the socioeconomic development of the region, the geography of the region, health services available in the region, demographics, and personal factors. Figure 1 is a schematic view of the factors affecting the interest of GPs in particular locations. According to our findings about a location’s economic, infrastructural, social, and cultural development factors, it can be concluded that such regional development has a considerable influence on a location’s attractiveness for GPs. Unfortunately, while numerous studies examining these variables and their roles in GP absorption and recruitment, no such research has yet been conducted in Iran. However, the attractiveness factors for GPs’ desired locations described studies in other countries are all consistent with the present study. For instance, Matsumoto et al. identified commercial land price in a region as a factor (34); Ricketts and Randolph as well as Kassak et al. identified the factor of urban development (35, 38), and Isabel and Paula identified income geography (33) as significant factors. Other studies have similar findings, indicating that service location status and level of development are affecting factors (6, 8, 19, 39, 40, 48). Among geographic factors, the most important considerations are the region’s climate and type (i.e., rural or urban). Many studies have shown the significance of the type of region in GPs’ location choices (6-8, 19, 34, 35, 38-40, 48). It seems that the factors of climate and geographic status are of great importance in Iran. This finding is one of the most noteworthy achievements of the present study, and further studies are required to determine the significance of these factors, inside and outside of Iran. Personal factors play a significant role in GPs’ selection of location, despite the extremely limited attention given to this issue in research conducted in Iran. In fact, personal reasons are a hidden factor in the allocation of professional workers to various regions; noting the country’s culture, these reasons should not be neglected. Memarzadeh Tehran provides a remuneration model for medical specialists, including four main dimensions (organizational, social, managerial, and psychological), arguing that the improvement of these dimensions would affect specialist retention (31). Also, Nasiri Pour et al. indicate that dual practice among physicians is due to income and payment system limitations, highlighting the importance of this factor (49). Other factors affecting the dispersion of physicians, which are consistent with the present study in Iran, include quality of life in the service location (37); the gender, university of medical study, and local residency of the GP (native); the number of healthcare visits per week and the average time spent per visit; the GPs’ income, schedule, and working hours; and educational and promotion opportunities (8, 19, 20, 36, 38, 41, 43). The healthcare services available in the region is another identified factor, which seems not only to affect the need for professional healthcare workers, but also to have a high influence on the absorption of physicians into these regions, increasing the GPs’ market potential. In general, these factors are categorized into two classes: the region’s healthcare system and the health status of the public in that region. In the former category, the number of hospitals, beds and healthcare centers (public and private), the dominating health policies, the number of physicians, etc. can be named, while the burden of disease can be mentioned in the latter category. As its importance was highlighted in the present study, other Iranian studies have stressed similar factors affecting GP dispersion, such as Keley et al. regarding number of beds (30, 48), Taghvaei, and Shahivandi in a study about the number of specialist physicians, hospitals, and healthcare and para-clinical centers (32). Goddard et al. identified a positive relationship between physician dispersion, the number of diseases in a region and the desirability of the existing healthcare center in the region (13). Other factors in the literature that align with the present research include the demand for health services, the implementation process of health policies, the centralization or decentralization of the health system, the number of existing GPs and specialists in the region, and the burden of disease (19, 40, 43, 44). The last identified element is a demographic factor, which not only affects the need and demand for services, but also affects a region’s attractiveness for GPs, perhaps due to the labor market. In a study conducted by Keley, a high level of dependency on the number of specialists in each specialized area per 100,000 of the population in the country’s public hospitals clearly shows the mentioned matter and is consistent with the results of this study (30). The number of employees in each industry in proportion to a region’s total population and its daily population rate is discussed in Matsumoto’s study, which is in line with this study (34). Consistent with our study, demographic factors are considered a major dispersion factor in other studies as well (8, 12, 44, 48). One such distribution factor in Iran is population size (46). 1) Since GP dispersion is a regional and international subject, and migration is an important consequence of a lack of attention to this issue in different countries, attention should be given to the comprehensive variables identified in this study. These variables, which can have an effect on GP dispersion and migration in all countries, are of great significance. 2) Healthcare-worker distribution and planning models should have a dual nature, considering the regional needs for GPs and the personal inclinations of the GPs as well. Otherwise, despite the implementation of the toughest GP distribution rules, a reduction of unequal access to GPs would be either temporary or impossible. 3) One recommended strategy to reduce the inequity of regional development involves the following steps: a) identify the status of each region; b) develop strategies to enhance the indicators of development in each geographic region (i.e., enhance the health principles in all national policies and the multi-sectorial nature of development indicators); c) convene a national committee, including different sectors, so that the abovementioned strategies can be executed; d) let the committee plan and organize the implementation process at the regional level. This issue is particularly important in developing countries due to the lack of unified procedures in HRH-related policies. 4) The remuneration system, medical service tariffs, and GP incentives are affected by service delivery location area; this should be revised and, perhaps, modified. 5) The imperative point in all the above recommendations is the sustainability of the implemented strategies. We would like to thank the ministry of health and medical education, especially human resources at the health office, for permitting us to fill out 400 questionnaires during one year. Authors’ Contribution: Study concept and design: Elham Ehsani Chimeh; acquisition of data: Elham Ehsani Chimeh; analysis and interpretation of data: Ali Akhavan Behbahani and Elham Ehsani Chimeh; drafting of the manuscript: Ali Akhavan Behbahani and Elham Ehsani Chimeh; critical revision of the manuscript for important intellectual content: Ali Akhavan Behbahani; statistical analysis: Elham Ehsani Chimeh; administrative, technical, and material support: Ali Akhavan Behbahani; study supervision: Elham Ehsani Chimeh and Ali Akhavan Behbahani.